SSAID Pricing is based on the number of active clients being served. No limit on users, no limit on workstations. Example IE... 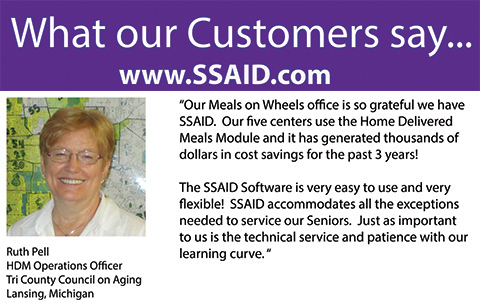 If your serving 1 to 1000 clients, the Monthly Price for all services of SSAID is only $100.00 per month! Again, this includes all services SSAID offers, free technical support, free customization, free data conversion...call us today for a Demo! SSAID Custom APPS for Tablets and Mobile Devices. 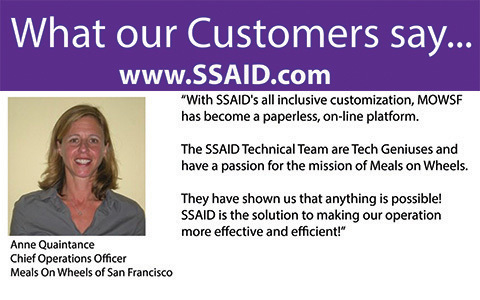 SSAID uses the technololgy to save our customers time and moneys. Paperless Route Sheets for Home Delivered Meals, Custom Mapping and Routing Features. Scanner and Touch Screens to track activities, wireless scanners to track trips, attendance... SSAID keeps on the leading edge of technology to make the software easier for our customers.